Split one 30A dock side receptacle between two 30A boat inlets or shore power cords. The EEL™ (Easily Engaged Lock) ShorePower Pigtail Adapter has the same jaw-clamp design as the EEL ShorePower™ cordsets and offers a secure, waterproof seal. This “Y” adapter splits a single 30A shore power service into two 30A applications. A built in light in the center of each female (boat side) connector makes hooking up to shore power at night easy. LED power indicator lights at both ends confirm that power is running through the adapter and serve as an alert that the cord is plugged into the shore side power source. Because these “Y” adapters feature the EEL jaw-clamp design, they can be used in wet environments. 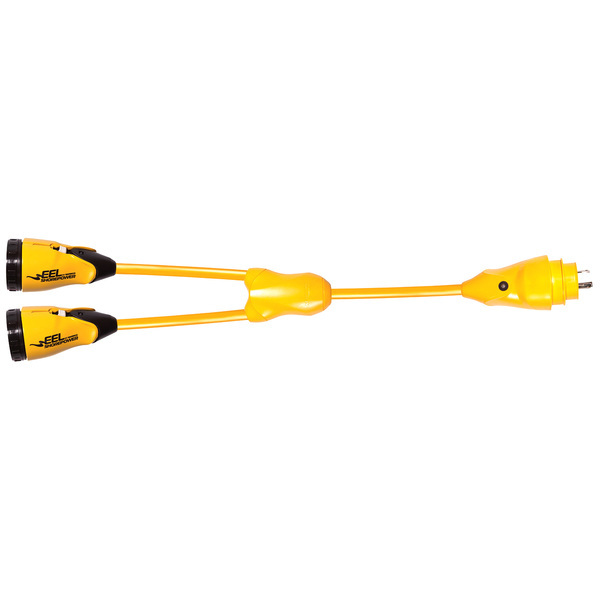 Included sealing collar provides watertight seal when connecting to two shore power cords to create a longer cord.